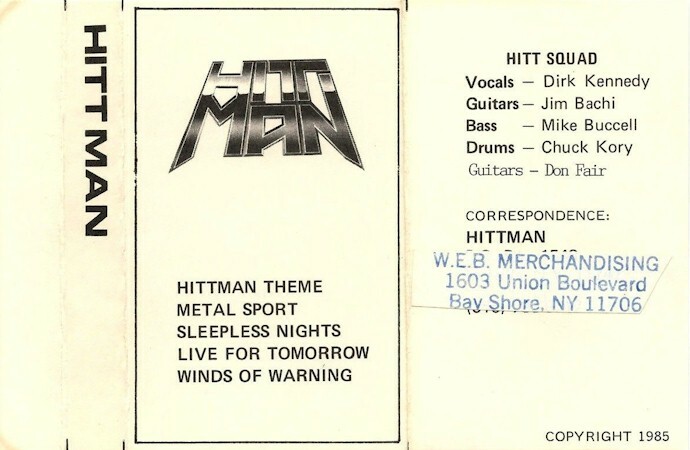 New York's HITTMAN was founded in 1984 by erstwhile ATTILLA members guitarist Jim Bachi and bassist Michael Buccell together with former TAKASHI drummer Chuck Kory. The band soon added singer Dirk Kennedy, who had previously been involved in the formative stages of ANTHRAX and took on a name influenced by the comic book character He-Man. The band added to their line up with second guitarist Brian Fair, previously a member of ALIEN. 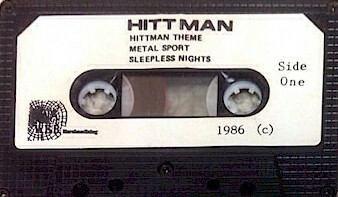 In mid 1985 this line-up issued HITTMAN's first four track demo - containing 'Metal Sport', 'Sleepless Nights', 'Winds Of Warning' and 'Live For Tomorrow'- quickly began to elicit rave reviews, especially in Europe, although record companies were slow in picking up on the buzz. It wasn't until 1988 when the New York quintet finally issued their debut product through German label SPV. Printed covers. No lyrics. Black tapes w/ stickers on the shell.